Cheers to Grey Likes Weddings for featuring this very sweet and intimate wedding today! This was actually my first wedding of the 2017 season and it holds such a special place in my heart for a couple reasons. I truly enjoyed my time with Leah and Alex. They have this easiness about them, this energy that is so in sync it is hard not to want to be around them. Their friends and family were so warm and welcoming. It was early enough in the season I could still wear my favorite blazer while photographing them (okay, that seems minor but if you shoot in August you know it isn't!) It was also my first collaboration with (and the beginning of a fantastic friendship) with Heidi of SHE Luxe Weddings and she put together such an incredibly talented team of vendors who rounded out such an incredible vision. And here is the real kicker for me personally. This was not only my first wedding of the 2017 season BUT this was also the first wedding of my first fully booked season since moving to Maine! If you don't know my story, I moved to Maine 4 years ago after having run Rachel Buckley Weddings out of the Midwest for 6 years. I sort of did this on a whim, mustered up a little faith and while it is a story for another time, took a risk on love (omg, how cheesy am I?!) I was not prepared to start the business over and I found myself back on the ground floor looking up that looongggg flight of stairs all us entrepreneurs are much too familiar with. So after many trials and errors, successes and failures I finally started to make progress climbing that darn staircase and by the end of 2016 I had a fully booked 2017 season. I am sort of tearing up as I write that. Do you know that overwhelming sense of excitement, accomplishment and pride you get after you hustled so hard and spent more nights than you count suffocating in self-doubt and insecurity? Yeah. It is indescribable. So this brings me back to Leah and Alex. Thank you a million times over for welcoming me into your lives! You are unforgettable! 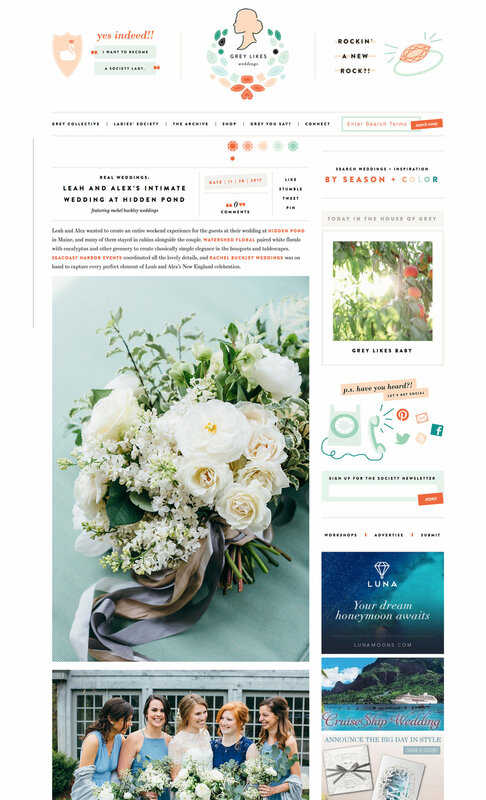 And a huge thank you goes out to Grey Likes Weddings for featuring Rachel Buckley Weddings! Today was a wonderful reminder that the ground floor is something I am now looking down on instead of something I am looking up from.